I develop a smartphone application for individuals.Nickname is TASARY. The player memorise the position that randomly appears in time series and taps there. This application is a game style brain training tool. You can set how many steps you will remember before and you can control the load freely. It is created based on the technique of N back task to train working memory (working memory). Working memory is the memory that you are using when working with any purpose, It is also used for conversation, reading and writing, calculation, etc., and thinking that is creative, It is a memory function that can be trained. People with dementia are associated with impaired functioning of this working memory. People with ADD (attention deficit disorder) and ADHD (attention deficit / hyperactivity disorder) generally it is said that working memory (working memory) is weak. Attention ・ Difficulty in concentration and hyperactivity are handled by working memory training, It is said that sustainable improvement is possible. 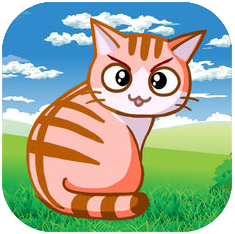 Side scroll jump Cat action game.Let's not get out of the screen while manipulating the cat while avoiding the enemy! let's collect coins and power up. Let's gather treasure of the world by opening a treasure box.